In 1978, an FBI agent recruited two con artists to set up a sting operation to bring down NJ politicians and members of the U.S. Congress who accepted bribery to speed up the licensing of a NJ casino. 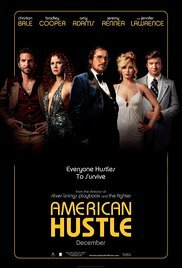 Directed and co-written by David O. Russell (Silver Linings Playbook), American Hustle is a smart, interesting take on government corruption. A solid and witty screenplay, at times needlessly convoluted, contributes to the overall appeal of the film. Music by Elton John, Ella Fitzgerald, Donna Summer, and Tom Jones, among others, keep the story dynamic and fluid. There's much to say in terms of the all-star cast, who has an electrifying chemistry working together. Teaming up with David O. Russell once more as in Silver Linings Playbook are Bradley Cooper, Jennifer Lawrence, and Robert De Niro (in a cameo role as a notorious Mafioso). As I said when I partially reviewed Amy Adams' filmography and in Her, she shines in a strong ensemble, and American Hustle is no different in that regard. Adams pulls off her most daring role yet, and she seems to have fun with her character. Bradley Cooper is proving to be a chameleon actor. He is at ease in comedies such as Silver Linings... and The Hangover, and equally able to handle more dramatic roles as in Limitless, The Place Beyond the Pines, The Words, and American Sniper. In American Hustle he joins Jennifer Lawrence again, though not as a couple as they were in Silver Linings… or the less successful and under-the-radar Serena. This year they have teamed up with David O. Russell (third time) in the much acclaimed Joy. Jennifer Lawrence is one of the actresses whose career path I have followed closely. She debuted in Winter's Bone and quickly scored roles in major productions such as The Hunger Games franchise (HG, CF, M-I, M-II), Silver Linings..., American Hustle, Serena, the lesser known The Beaver, and this year's Joy. Thus far she has played amazingly two types of characters: the bold, strong female doing anything necessary to survive, and the fragile, emotionally unbalanced female, or a combination of both. She plays those roles to perfection but she should avoid them in the future if she wants to avoid being typecast. Christian Bale is another chameleon actor. I loved him in Empire of the Sun as a child actor, in 3:10 to Yuma opposite Russell Crowe, as Batman in the phenomenally successful Christopher Nolan's Batman trilogy (BB-DK, DKR), as the druggie in The Fighter, and now in American Hustle. He chooses his roles carefully, and despite his reputation of being difficult to work with, he excels in those roles. To complete the ensemble is Jeremy Renner, whom I first saw in The Town. This movie gave him instant fame, but he went on to make a couple of unwise career choices before straightening his path again. He has gone to act in Hansel and Gretel: Witch Hunters (a career mistake, in my opinion), The Bourne Legacy (yet another mistake), American Hustle, the astronomically successful Avengers franchise, and now the Mission Impossible franchise (GP, RN) as well. He is equally at ease both in dramas and action films. I had a great time watching American Hustle. I found its unexpected ending reminiscent of Thin Ice. Loved this movie. Thought it was robbed at the Oscars. It's possible. I can't quite form an opinion yet because that year my father became ill and I didn't get to see most movies released between October and early February, which are typically the ones considered during the awards season. I just visited your post and left a comment. I totally agree with you about this one. It was thoroughly entertaining and fun to watch as much for the cast as for the music, the topic, and its technical elements. I thought it was a very accomplished movie. Great review of a great movie. I might have to see it again! Thank you, Judy. I had a great time watching it.